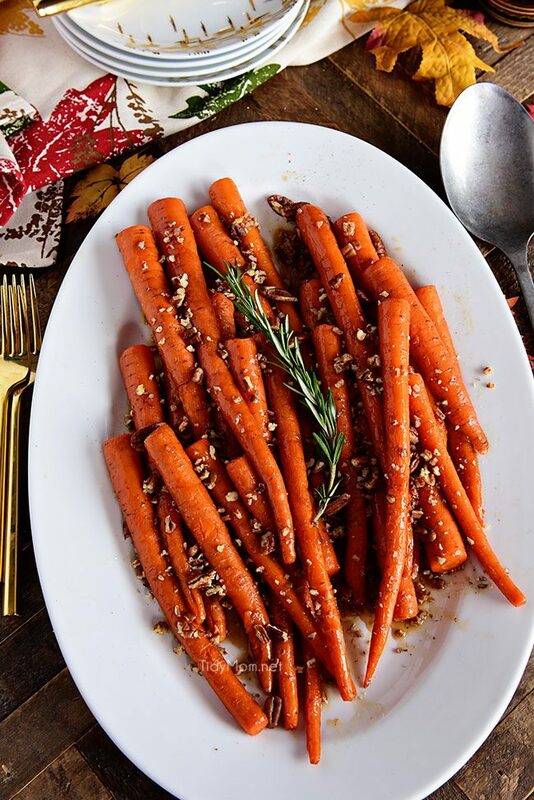 Pecan Pie Glazed Carrots are a dish with a festive holiday feel, making it ideal alongside roasted turkey or glazed ham. Brown sugar and maple-glazed carrots have a nice crunch from the cinnamon toasted pecans, making them sweet as pie. 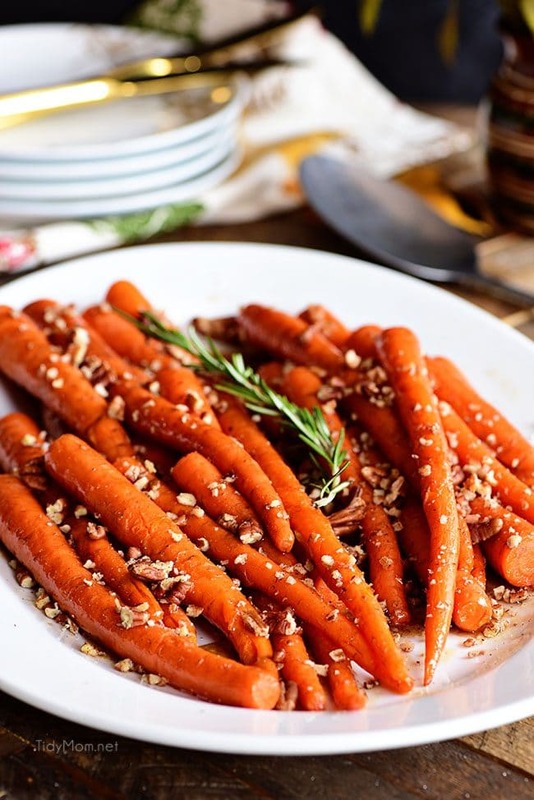 We love carrots, no matter how you fix them like Grilled Carrots with Lime Dip, and Carrot Cake. Who says you have to choose between healthy and indulging in pie this Thanksgiving? I’m here to show you that you can do both with this carrot side dish that gives you all the flavors of your favorite pecan pie. I know, I know carrots are totally not the same as pie, but this amazing pecan glaze gets you so close to the taste of pie it’s almost magical. 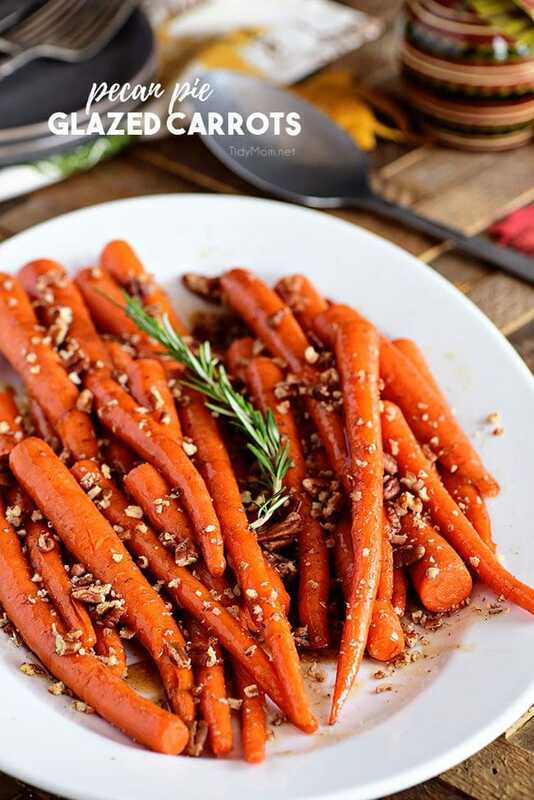 Your taste buds will be truly surprised by how sweet and delicious these cooked carrots are! They are quick, easy, and one of the most delicious ways to get your family to eat their vegetables! It’s a recipe perfect for the holidays and easy enough for any day of the week. 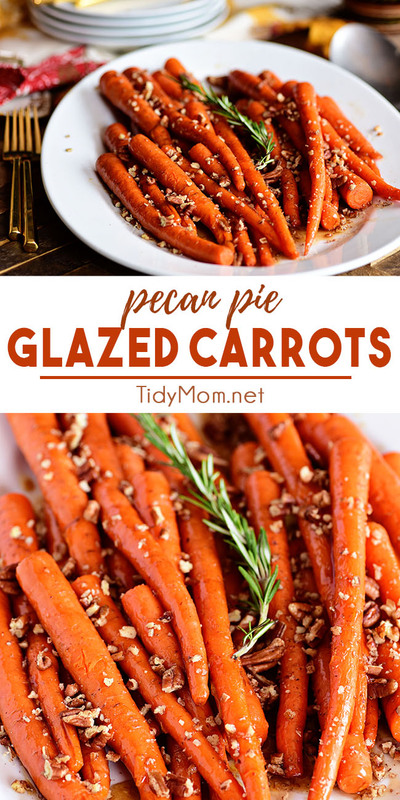 The pecan pie glaze adds so much flavor and takes simple carrots to a whole new level of deliciousness! Making glazed carrots is super easy! Glazing the carrots enhances the sweet flavor of the carrots without losing the bright color. This stove-top method takes about 15 minutes from start to finish. The butter, brown sugar, maple syrup, and cinnamon melt together in a skillet with the carrots and are cooked over medium heat until tender. That’s it. Serve with cinnamon toasted pecans, making them sweet as pie. THAT’S ALL IT TAKES. So if you’re looking for one more side dish, why not try these Pecan Pie Glazed Carrots? Fast, easy, and full of flavor, this veggie will be an excellent addition to your dinner table this holiday season! I use medium-sized skinny carrots but you can use baby carrots, large carrots cut or even rainbow carrots make a beautiful presentation….whatever you’d prefer. This recipe is so easy and full of warm flavors, any carrots will complement them perfectly. The best part is that the carrots are cooked to a tender perfection. This sweet, buttery and perfectly delicious recipe will keep your oven free and practically make themselves! Cranberry Walnut Sweet Potato Rounds The perfect addition to your Thanksgiving table. 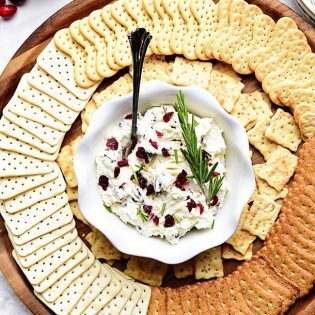 They’re the ideal mix of traditional and new with all the flavors of Thanksgiving in one tasty bite. Fresh Green Beans With Bacon and Sliced Almonds This quick and easy recipe for green beans combines steaming and a quick saute for ultimate flavor while still retaining nutrients. Layered Walnut Pumpkin Pie This is not your ordinary pumpkin pie, it’s heaven in the form of a fluffy, soft, scrumptious, cold creamy pumpkin pie! Oatmeal Cookie Sweet Potato Casserole All the Fall flavors in a one-pan dish including cranberries, raisins, cinnamon, pecan, and sweet potato. It’s the perfect sweet side dish to accompany all those savory Thanksgiving dishes! 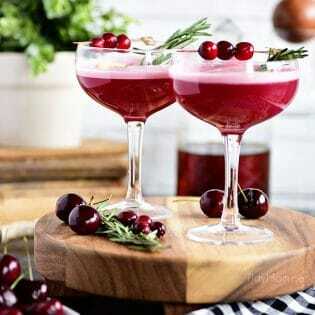 Cranberry Mulled Ale brimming with festive flavors. Full of cinnamon, honey, ginger and nutmeg, the drink smells and tastes just like the holidays. Cranberry Jalapeno Honey Baked Turkey The most amazing turkey brine and glaze recipe, that produces a golden glistening juicy turkey with a crispy crust! 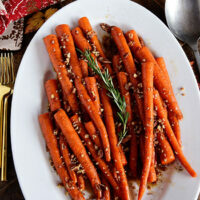 Like This Glazed Carrots Recipe? Pin It! With the holidays right around the corner, this easy side dish would be an impeccable and colorful addition to your dinner spread. It’s always a hit in our house, and I know it will be a hit in yours too! Put a large skillet over medium-high heat and melt butter. Add the carrots and a good pinch of salt. Cook, tossing occasionally, for 5 minutes. Add 1/2 cup water, brown sugar, maple syrup, and cinnamon and bring to a gentle boil. Reduce heat and simmer covered until the carrots are just tender, 4 to 5 minutes, shaking pan occasionally. Transfer carrots to a serving dish. Return skillet to heat and continue cooking uncovered until syrup is a glaze-like consistency, 1 to 2 minutes. 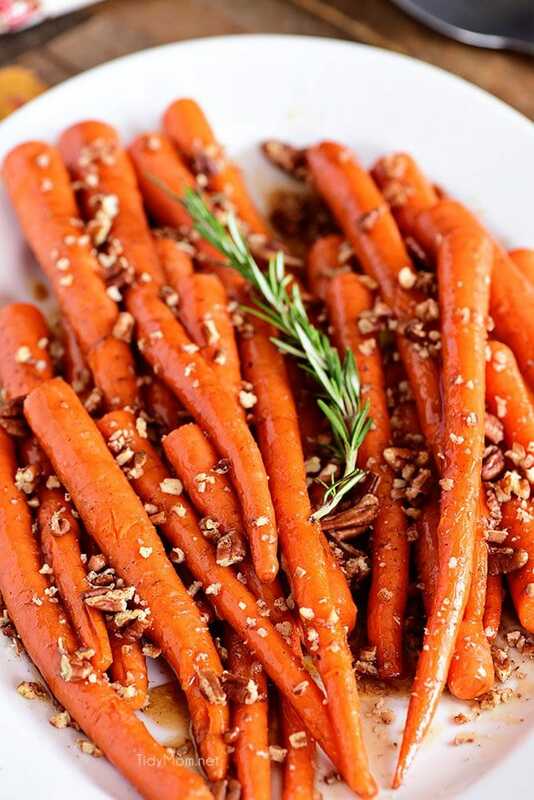 Pour glaze over carrots, sprinkle with pecans and serve immediately. Okay these are awesome. Love the extra crunch! Dude! This is brilliant and I bet it goes fast on Thanksgiving Day! Well I just found my new favorite Thanksgiving side dish! Yum! This sounds so amazing! I can’t wait to try these!